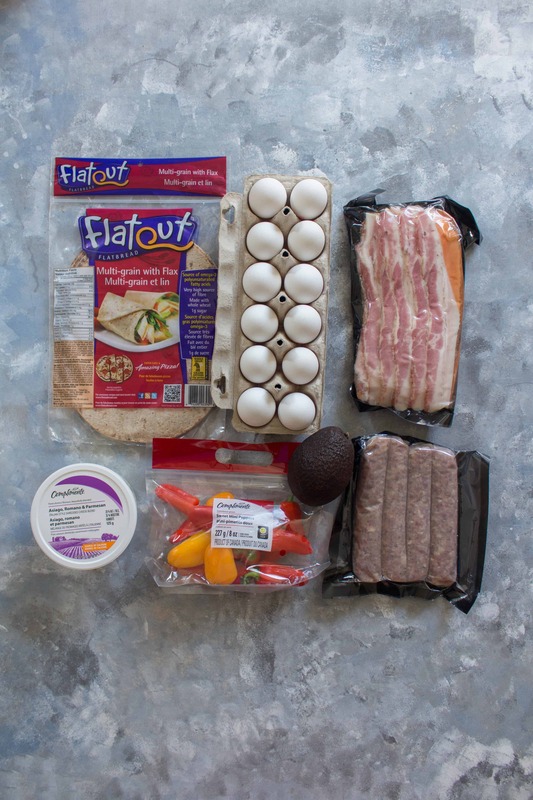 These freezer friendly breakfast wraps are the perfect grab and go breakfasts for busy weekday mornings. Recently work has been up to my eyeballs. Between extra shifts and a higher workload, I’ve been going a little crazy. Don’t get me wrong, I love work because I love being able to pay my bills but this gal needs more hours in a day! 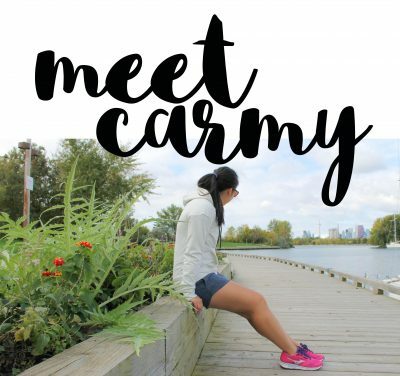 To make use of all my time in a more efficient manner, I’ve been trying to meal prep breakfasts so I can either sleep those extra precious minutes or go on a run since I’m supposed to be training for a half marathon! Anyways, not too long ago, I had order a truLOCAL box which is a subscription of local meats for Ontario. After it came, I put most of it away in my freezer and forgot about it. Fast forward to now, when I’m trying to figure out breakfast meal preps that are freezer friendly and I remember that not only did I order bacon, I ordered garlic sausages as well! 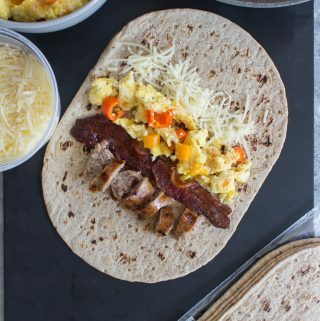 And just like that, these freezer friendly breakfast burrito wraps were being made. Not a sponsored plug but want 2 free Striploin Steaks or 4 Wild Caught Alaskan Salmon Filets for your first trulocal.ca box? 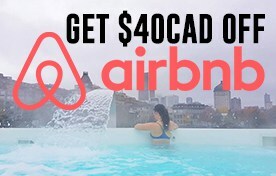 Use my referral code “TRULOCAL9491” This is for Ontario and Alberta only. make sure you place your ingredients down like the image below. If you place the ingredients width-wise instead, you might have just one bite of each ingredient at a time instead of a bite with a bit of everything! Prep your scrambled eggs with peppers, bacon (I usually oven bake mine), and sausages. Divide up the ingredients into 1/6 to go on each of the 6 tortilla wraps. Wrap tightly. Wrap the burrito with saran wrap or parchment paper if you plan on freezing them. Freeze the burritos in a single layer on a baking sheet — they'll freeze faster and more uniformly this way so you can place them together in a ziplock bag afterwards. From frozen: Unwrap and microwave for 1 to 2 minutes, until warmed through, or heat in a toaster oven at 350°F for 10 - 12 minutes. 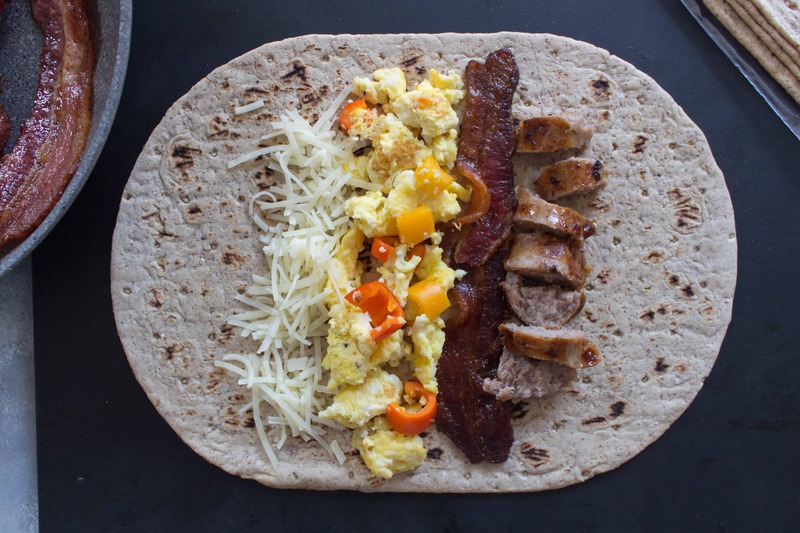 I would eat these breakfast wraps any time of day. I would for sure eat them in our weekly “breakfast for dinner” night. So much better than anything you can get at Mickey D’s, or anywhere else for that matter. These wraps look like they’d be great for breakfast, lunch or a quick and easy dinner… with a glass of wine, of course. I’ve never actually tried making a premade freezer friendly wrap before — usually I’m just scouring the fridge for whatever’s handy, but I can absolutely see the benefit of having a ready-to-go meal on hand during a busy workweek. The kids would love this too! This week was a little crazy and I came upon these during a moment of quiet. Made some up and put them in the freezer and a few days later remembered I had something yummy to grab to take and go! SO MUCH better than what I usually eat (think drive thru) … Im a convert! I’ll be adding this to my Sunday morning prep for the week! These look so good. As someone who is always looking in my fridge in the morning wishing I could have something already ready to eat these freezer wraps are such a great idea! I’m much more into doing a bunch of prep one day and then enjoying the fruits (or eggs and sausage 🙂 ) of my labors the rest of the days. What a great idea! I never thought of freezing ready made wraps but now I will, I know my son would have one or a few any time of day! Great idea! It seems like such a time saver in the morning. I never thought of setting these up in advance and freezing them! Thanks for the suggestion. I’m already thinking of different ways to play around with the recipe, I want to try your mushroom idea. 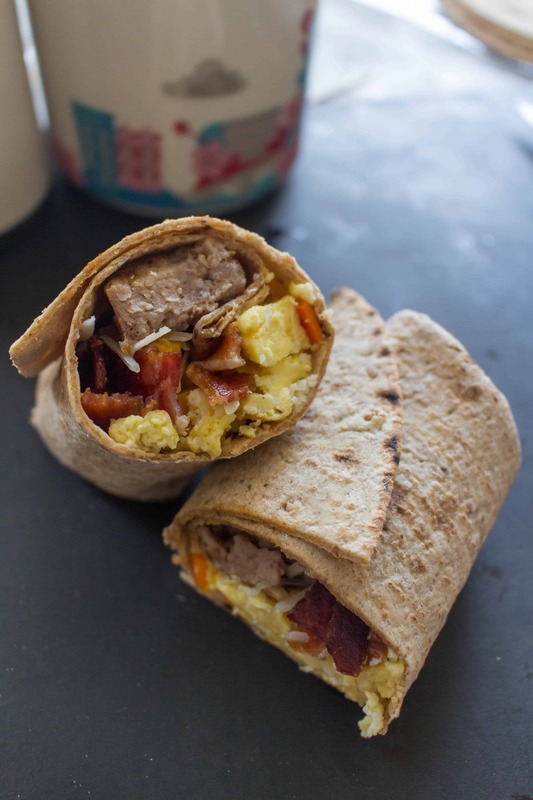 I would love these wraps every morning. Such a great post for all of us busy people — especially now that school is about to start. These wraps would be easy to warm and then give to the kiddos before they are off to school. Oh Carmy. THIS. This would be such a damn treat during the week. I hear you with being up to your eyeballs in work, and as a result, I’ve either been skipping breakfast or just eating boring ol’ toast. My sister-in-law makes freezer breakfast burritos on the reg, so I’m going to have to send her this too so she can change it up! This looks and sounds so hearty and comforting. Just the way some days should start! These are great for back to school and easy breakfasts in the morning. 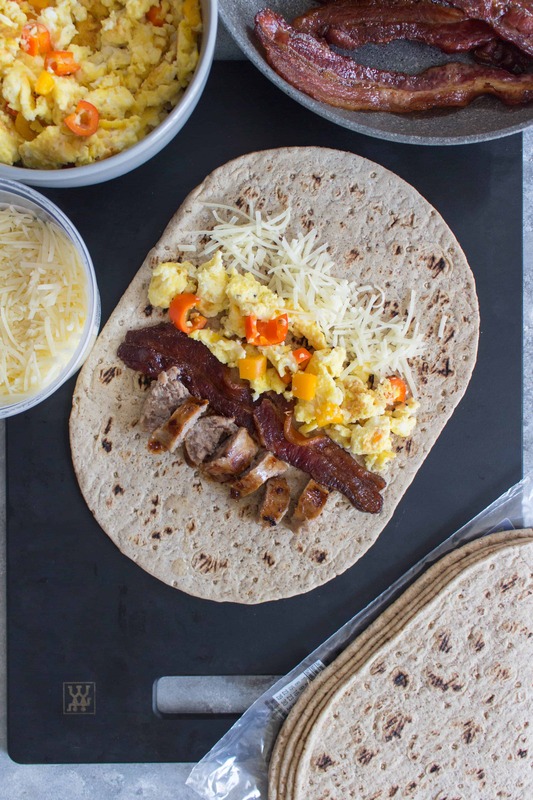 Breakfast burritos are always a favorite for us. Great tip about the food placement in the tortilla. I’m so glad I saw this! School starts up in three weeks and I know life is going to be hectic and crazy. I’m going to have to make a bunch of these and stick them in the freezer to have on hand while we are settling back into the new school year.